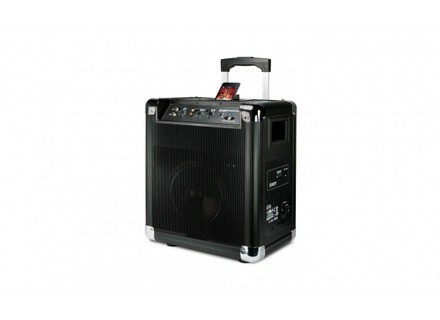 Block Rocker, Portable PA Speaker Cabinet from Ion Audio. Ion Audio,introduces Tailgater Bluetooth and Block Rocker Bluetooth, a pair of speakers for Bluetooth music players. They are portable sound systems that include a speaker, an amplifier, audio inputs, an AM/FM radio, and wireless Bluetooth technology, all in a cabinet. 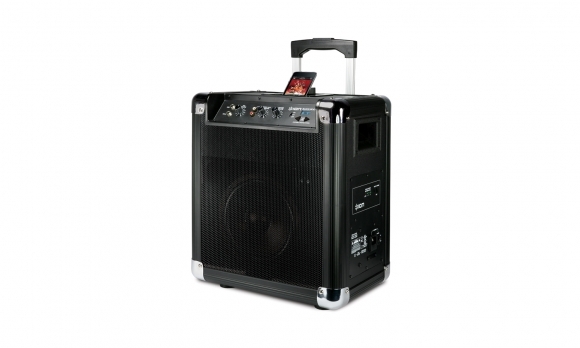 The TAILGATER BLUETOOTH has handles for transport, and BLOCK ROCKER BLUETOOTH features wheels and a retractable handle. With Bluetooth capability, both new speaker systems allow you to keep your iPad, iPhone, or other Bluetooth-enabled device by your side as you crank up your music over a powerful 20-Watt speaker. Both TAILGATER BLUETOOTH and BLOCK ROCKER BLUETOOTH also feature a built-in battery that will provide up to eight hours of music. A microphone is also included with both systems. American Audio SenSeries Speakers The SenSeries Speaker System consists of the Sense 8, Sense 12 and Sense 15 Speakers, along with the Sense 15B and Sense 18B Subwoofers. [NAMM] DPA Mics d:fine & Reference Standard DPA Microphones will be showcasing their d:fine single-ear headset microphone and their Reference Standard Mic Series at NAMM. Clockaudio CW-200 Clockaudio is launching the CW-200 dual channel wireless conferencing system at ISE.